Earlier this week we told you that several users had received an early copy of Pokemon X and Y and had wasted no time in providing an early look at the game, with obvious spoilers to follow. We knew that this information would eventually lead to the unveiling of the Pokemon X and Y final starter evolutions for Froakie, Chespin and Fennekin. For those that are badly looking for this information, your search is over. We now have details on the final evolutions for you, confirming that Frogadier will evolve into Greninja (as rumored here), Quilladin evolving into Chesnaught and finally information confirming that Braixen will evolve into a creature known as Delphox. We had to do some digging to find the information, but actually if you do some Twitter searches for the above criteria, you should already find plenty of information for the final evolutions – we won’t post the images here though for obvious reasons. What we can do though is point you in the direction of where to find them. Stats for Chesnaught can be viewed here, confirming that the final evolution of Chespin will have attacks such as Seed Bomb, Bite, Needle Arm and Spiky Shield. Information on Greninja was a little harder to find, but you’ll find the juicy stats image here. The move list involves attacks such as Smack Down, Lick, Water Pulse and Water Shuriken. Last but not least, we finally have an image of the elusive Delphox to show you. You can view this here and actually we’ve seen early feedback that the design isn’t too favorable – do you agree with this? Once evolved, Delphox becomes a Psychic Fire type and gains the moves Psybeam, Light Screen, Psyshock and Mystical Fire. The names sound awesome, but what do you think of the designs? We think a lot of Pokemon fans will now be choosing Chespin, as the final evolution into Chesnaught looks great. Don’t forget this info is coming on top of an official confirmation of mega Charizard X. The information continues to pour out, but give us your thoughts on the final evolutions that have now been exposed. Be sure to share these details with your friends. To those saying it’s fake, how is it that a few days after 2 Canadian stores sold X and Y games early, people were posting very convincing images(different angles, pokÃ©dex, Pokemon-amie, actual VIDEOS of the pokemon evolving, etc.) of the game and pokemon and why did Nintendo start to get pissed off when these leaks were all over the Internet on that same day the games were sold early? Nintendo even sent people over to those stores to stop them from selling it, recalled the games, and tried their best to stop the leakers from leaking. Delphox looks like a cousin of Renamon as for the others I hope there not the final evolutions of the starter pokemon. It can’t be… I have a slight hope because these final forms are not coherent with the previous ones (especially Chesnaught) and, in addition, they are very ugly. I hope Nintendo will release other evolutions, but it is very unlikely now… Unfortunetaly. I personally believe it is too early to call these confirmed. While some users did get the games early, other screenshots of other faux final evolutions have been passed around- these ones aren’t exactly exempt. Maybe they are real, but until Nintendo themselves confirms the final evolutions, I don’t think I’m going to believe these are it. I’m totally cool with how they look, but I feel something is off about them. WHAT DOES THE DELPHOX SAY? Yeah….yeah, I think I found a new favorite starter in Greninja. 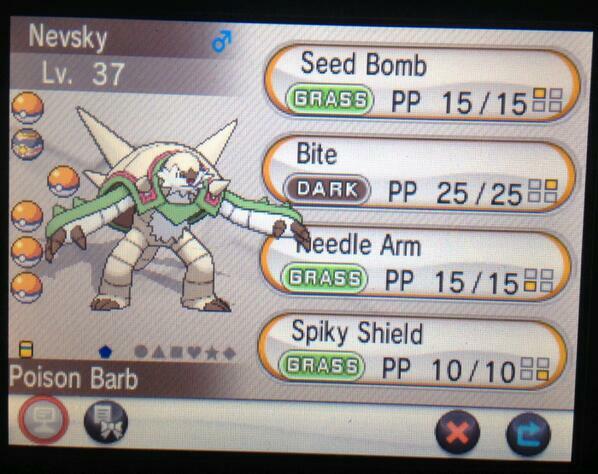 I think chesnaught at least is fake, why would its arm go over a move name? Oh wow. That Delphox fanart managed to salvage the design for me, at least a little. Doesn’t even matter! We all get Kanto starters anyways! #TeamKanto!!! TEAM FROAKIE!!!!!!!!!!!!! WATER SHURIKEN YYYYYEEEEEEEAAAAAAAAHHHHHHHH!!!!!!!!!!! I’ve been a Chespin fan since the beginning. But I kinda feel like it was too drastic of a change from Quilladin to Chesnaught. Don’t get me wrong, I still want Chespin, but it still feels…..off. These are not confirmed by Nintendo, they are not official yet. We have seen fake leaks like this before and I choose not to believe these are legitimate. It’s unprofessional of these sites to say that these leaks “confirm” the final evolutions of the gen 6 starters, as it has not been officially released information by Game Freak themselves. The only real one is Delphox because its model is 3D! The other two pictures are drawn and only look 2D. They ruined it with the final started evolutions they could have made them much better. Chespin, and frokies second evo’s looked so awesome. Dissapionted in the way they turned out.